Ultimately, a point at Anfield may not be sufficient for Sunderland in their quest to remain in the Premier League. But a dramatic late rescue act to earn a 2-2 draw at Anfield at least keeps Sunderland's survival hopes alive, even if the gap to the safety mark remains at four points. Sunderland looked to be heading to a second defeat within the space of five days after second half goals from Roberto Firminho and Adam Lallana put Liverpool on course to coast to victory. Yet as Liverpool fans left Anfield amidst protests over rising ticket prices, Sunderland fought back with two goals inside the last 10 minutes. First, substitute Adam Johnson curled home a free-kick, before Jermain Defoe netted an equaliser with a minute to go. The draw came at a cost though, with Defoe injuring his hamstring as he ran onto a through-ball in stoppage time. Sam Allardyce was forced to make two changes from the side which lost against Manchester City in midweek, with Wahbi Khazri and Duncan Watmore replacing the ill Fabio Borini and injured Jeremain Lens. Patrick van Aanholt sent an early long-ranger a couple of yards wide after a lovely flick from Khazri on halfway had allowed the left-back to race into the Liverpool half unchecked. 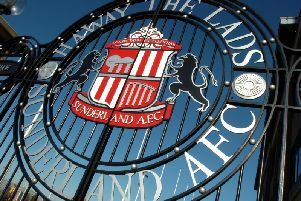 But Sunderland were content to sit back and soak up the pressure in the early stages, with Liverpool unable to produce a meaningful effort until the 20th minute, when Alberto Moreno was denied by an excellent save from Vito Mannone. Kirchhoff was caught on the ball midway inside his own half and Adam Lallana fed the overlapping Moreno down the left flank. Moreno hit a left-footed shot across Mannone, but the Italian did superbly to divert the ball over the bar with his outstretched left leg. Moments later, Watmore was forced off with an ankle injury, with Dame N'Doye taking the place of the 21-year-old. Towards the end of what was a dire first half to watch, Firminho went close with a superbly-struck 25-yarder which just cleared the crossbar. Then in first half stoppage time, van Aanholt was forced into emergency measures to turn Adam Lallana's cross inches over his own crossbar, with substitute Jordon Ibe waiting. Firminho again let fly from distance in the 54th minute after nutmegging Jan Kirchhoff, but the Brazilian's effort flew a yard wide of the post. Jermain Defoe had a first sight of goal just before the hour, following an awful throw from Simon Mignolet, who sent the ball straight to Kirchhoff. The German picked out Defoe on the edge of the area, but he scuffed a shot a couple of yards wide. Moments later, Liverpool broke the deadlock when James Milner's looping inswinging cross from the left went all the way through to Firminho at the far post, who headed back across goal and into the far corner. Billy Jones then had to divert a powerful goal-bound shot from Ibe over the bar with his head, as Liverpool came close to a quick-fire second. Mannone had to produce a quick-fire double save in the 64th minute to deny Lallana and then Ibe, as Liverpool went up a gear. But van Aanholt should have levelled for Sunderland three minutes later when Khazri played him in down the left-hand side of the Liverpool area, only to fire harmlessly into the side netting at the near post. That miss was to prove costly as Liverpool doubled their advantage in the 70th minute after Jones was caught dallying in possession by Firminho. The Liverpool frontman raced down the left and pulled it back for Lallana to tap into the empty net. That seemed to be that, but with Liverpool fans streaming out of Anfield in protest at ticket prices, Sunderland pulled one back with eight minutes to go when substitute Johnson curled a free-kick low into the bottom corner, with Mignolet unable to keep it out. And with a minute to go, Sunderland pulled level when Khazri fed Defoe with his back to goal 10 yards out. Defoe managed to spin away from the attentions of Mamado Sakho, before firing past Mignolet at his near post. Liverpool: Mignolet, Clyne, Lovren (Toure 12), Sakho, Moreno, Henderson (Lucas 86), Can, Allen (Ibe 45), Lallana, Milner, Firmino. Subs not used: Ward, Benteke, Sturridge, Flanagan.